Kubaba is the Hurrian Goddess of the city of Carchemish, Turkey, on the Euphrates River, at the Syrian border. She was usually depicted as a regal woman wearing a long robe, either standing or seated on a throne. She holds a mirror in her left hand and a pomegranate in her right hand, symbols respectively of magic and fertility. She was adopted by the Hittites after the fall of the Hurrians, and eventually evolved into the Phrygian Goddess Cybebe, later known as Cybele to the Romans. 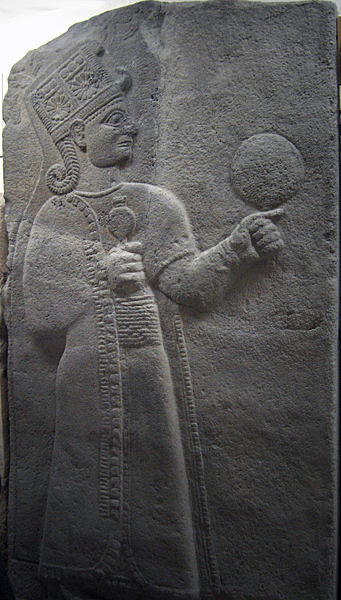 Source: Museum of Anatolian Civilizations, Ankara, Turkey. Previous PostPrevious Another Pi Crop Pattern in England?